Elliot Hillary Dogbe is an eleven year-old boy who lives in the Volta region of Ghana and the National Peace Ambassador. His involvement with the Open Dove Children’s Foundation led him to become not only the voice of the foundation, but that of the children and of thousands of Ghanaians. In the past year he has delivered a large number of speeches on peace, harmony and societal issues and has travelled to meet thousands of people from all over the region. He has also addressed religious leaders, political parties and opinion leaders in schools and church camp meetings. Elliot’s peace campaign contributed greatly to the free, fair, peaceful and victorious 2016 election in Ghana. His gifts of speech and persuasion echo young people’s desire to live in a country at peace. This finalist benefitted from a large support network and received the most votes overall. 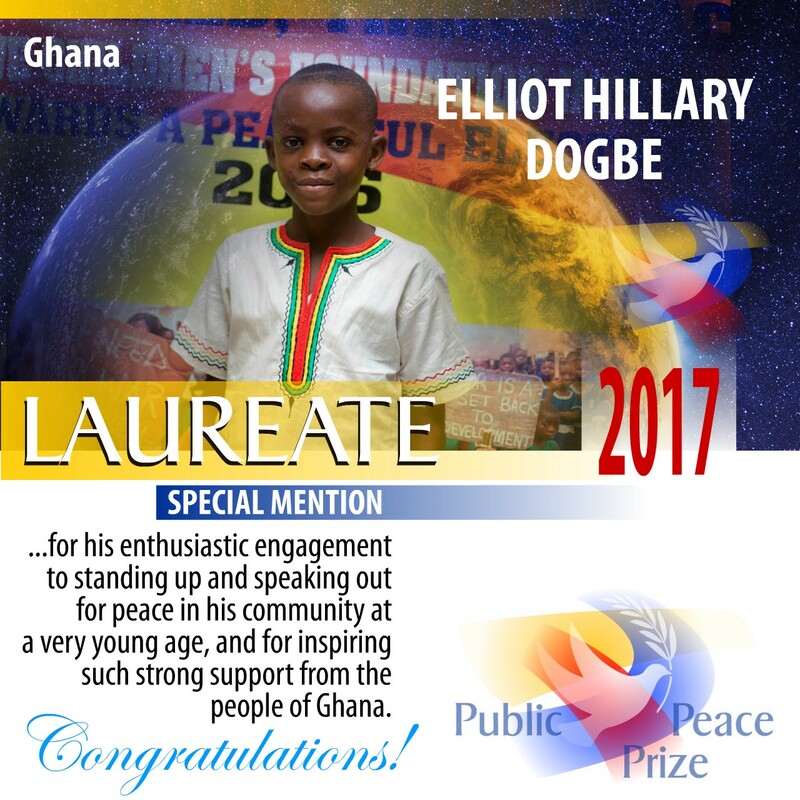 In recognition of the support from his Ghanaian compatriots, the jury proclaims ELLIOT HILLARY DOGBE Laureate of the Public Peace Prize for 2017 in the Youth Peace Ambassadors category. Khairatul Saidu is a 17 year-old Nigerian peace activist who is fighting for the rights of prisoners who have been unjustly sentenced and for youth empowerment. Khairatul’s activism sparked when her parents were unjustly imprisoned when she was only 12 years old. This caused her much suffering. She has since become engaged in a number of activities including leading conferences in communities, creating an online arena for youth to share ideas, and approaching the government about the Millennial Objectives. However, she is still most involved with defending prisoners who are unfairly treated and too harshly sentenced. She is a member of the GenUN, World Youth Alliance and of many more prestigious organizations. She is a Youth Millennium Development Ambassador and has petitioned government for global peace and development. Her efforts are divided between visiting prisoners and empowering youth. Winner of several peace awards already, she is also the founder of the Khairatul Saidu Foundation. 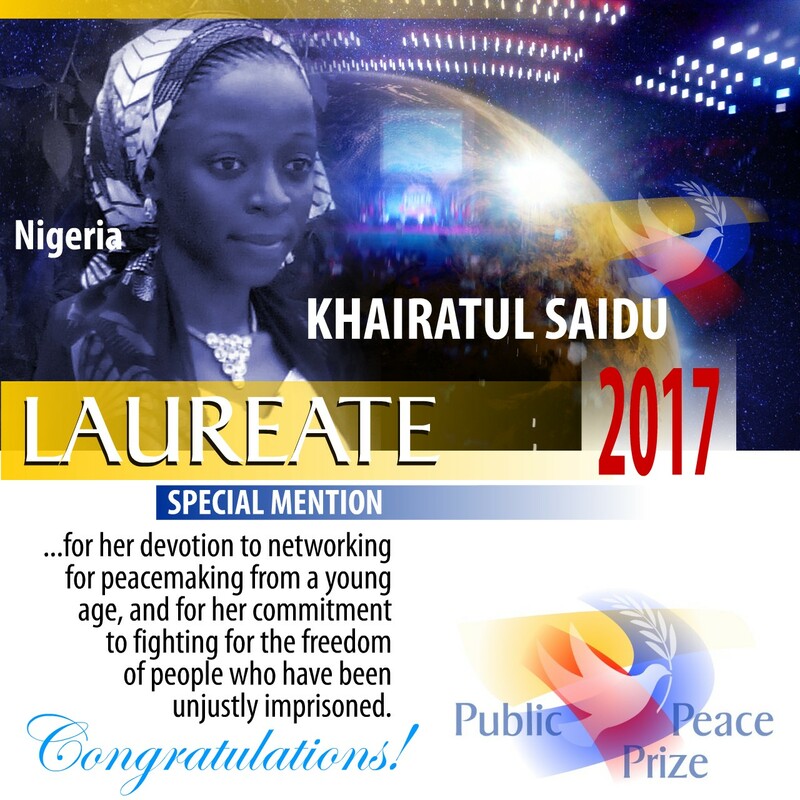 Impressed by the quality and quantity of support she received from the public, a support which speaks of her contagious enthusiasm and her courage in defending the rights of prisoners, the jury proclaims KHAIRATUL SAIDU Laureate of the Public Peace Prize for 2017 in the category Youth Peace, Justice and Freedom Ambassadors. The promotion of a sustainable culture of peace among all people is David and Renate Jakupca’s mission and life’s work. David and Renate Jakupca founded The International Center for Environmental Arts (ICEA) which supports research, information sharing, and effective action promoting a sustainable culture of peace. Examples of their projects include building an environmentally sustainable home and eco-museum in Berea. In an effort to end violence in America’s youth, it has also created the World’s Children Peace Monument and the Great American Peace Trail, a coast-to-coast trail of peace stones in city parks. Dr. Renate Jakupca was presented with the world’s first Doctorate in Environmental Arts and Peace Sciences. David Jakupca is officially credited with being the spiritual father of the environmental art movement. His paintings and sculptures have been critically acclaimed around the world. In 1996 his Endangered Spaces traveling art exhibit was showcased at the United Nations World Conference on Cities – HABITAT II in Istanbul, Turkey. Recipients of many awards, David and Renate Jakupca believe that humanity’s future lies in the younger generations. They will successfully ally economy and culture with technology thanks to education and a just and sustainable peace. 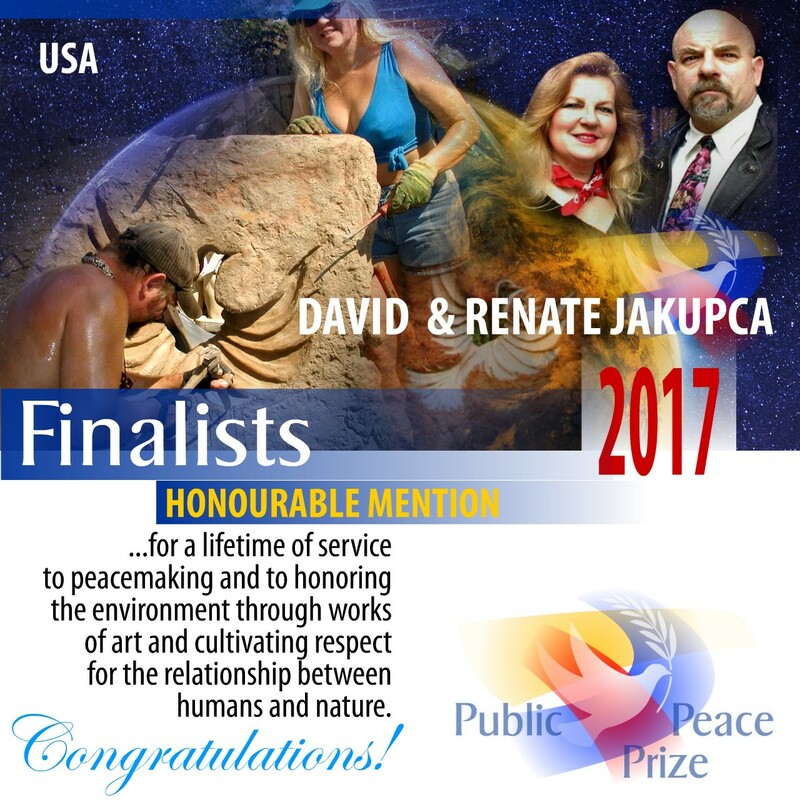 The glowing and extensive comments from people of many nations prompt the jury to applaud the impressive and sustained personal and professional commitment of DAVID and RENATE JAKUPCA, finalists of the Public Peace Tribute Prize for 2017 in the category Creative Artists for Reconciliation and Peace with the Environment. They receive an Honourable Mention for a lifetime of service to peacemaking and to honoring the environment through their artwork. Coraline Parmentier is a 21 year-old classical pianist who uses her talents to further world peace. Her music is a way to help create harmony and understanding between peoples. After graduating from Rouen Conservatory, she was admitted, at the age of 17, to the Geneva University of Music, where she obtained a Baccalaureate of Arts. Sensitive to cultural differences and to the possibility of discrimination toward incoming refugees into Europe, she became captivated by music from around the world and began to bring the beauty of lesser-known music to others. With her explorations of ethnic classical music, she hoped to encourage a deeper understanding of others. After studying South American composers, she dedicated her musical talents to transcribing music for traditional oriental instruments such as the oud, to play on the piano. Her life’s project is to play all the music of the world – particularly the music of the oppressed – so as to open the hearts of her audiences to others. Coraline Parmentier gives concerts as the artistic patron of many associations and charity and civil organizations. She received the Engagement Award of the Geneva Ethics and Values Foundation. 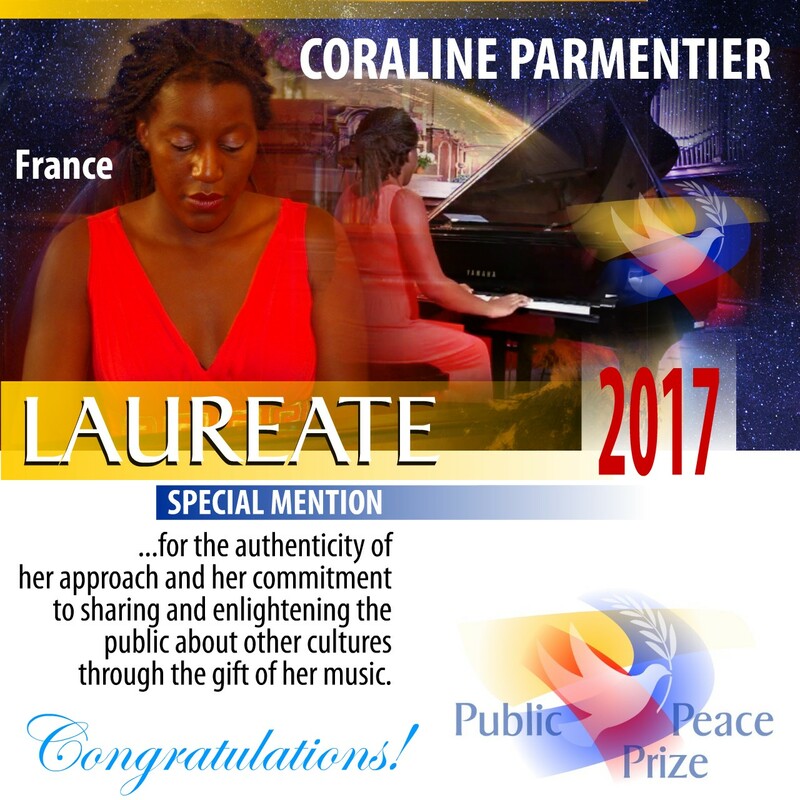 Because of her numerous supporters and the many testimonials by persons who were touched by her personal commitment, the jury is very pleased to proclaim CAROLINE PARMENTIER Laureate of the 2017 Public Peace Prize in the category Creative Artists for Reconciliation and Peace. In a country where almost half the population is illiterate and where there are an estimated three guns per person, one man works at great personal risk resolving armed conflicts and violent crimes. Sheikh Al-Marwani started his peace mission twenty years ago, when he established Dar AL-Salam Organization, or The Peace House, in Yemen. The results are quite impressive: over one thousand community or interpersonal conflicts have been resolved; 250 local committees formed for peace involving some 4000 leaders throughout the country. Sheikh Al-Marwani and his team use technology, workshops and theater-based awareness campaigns to get his anti-gun message across while proposing peace and tolerance. These twenty years of dedicated work reveal a man of exceptional interior strength, a unique leader in his country. The testimonials received and the public’s support underscore the courage of this man who has won both admiration and support. 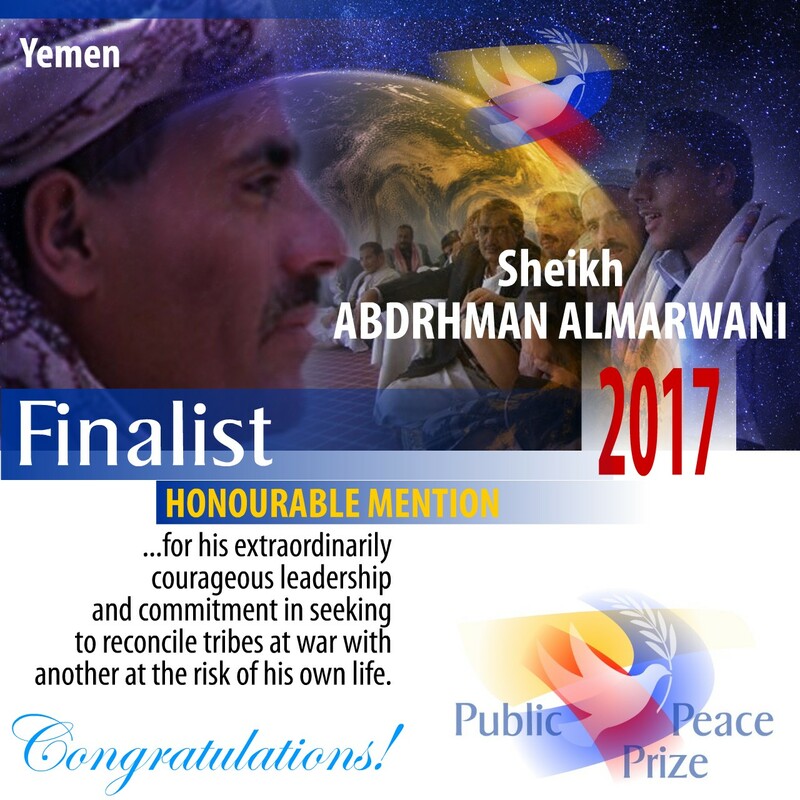 The jury presents an Honourable Mention to Sheikh ABDRHMAN ALMARWANI, finalist au 2017 Public Peace Prize finalist in the category Mediators for Reconciliation between Groups Divided by Conflict. “Aaghaz-e-Dosti” (the literal meaning of which in Hindi/Urdu is ‘beginning of friendship’) is a citizen’s initiative that works against all odds to create havens of peace and friendship between two traditionally rival communities (India and Pakistan). They have been working at this relentlessly for the past four years. The team is comprised of students and young professionals, mostly women, from both sides of the border, who volunteer their time. Other chapters of this organization are present in many cities in both countries. Aaghaz-e-Dosti is focused on citizen diplomacy and works primarily through peace education aimed at familiarising people about the “other”; countering stereotypes of a homogenised and negative image of the other; educating on issues of conflict and the existence of diverse views and developing critical thinking and faith in dialogue and peace-building for conflict resolution. Aaghaz-e-Dosti also condemns issues of violence, ceasefire violations, killing of soldiers, and discrimination meted out to victims of conflicts. They believe that the voice for peace and sanity often goes unrepresented in mainstream media. Aaghaz-e- Dosti has been constantly writing to the governments on both sides about incidents of ceasefire violations, decisions made about talks, and execution of decisions made in government meetings. Most of the public’s support went to this civil initiative which was considered both innovative and bold. 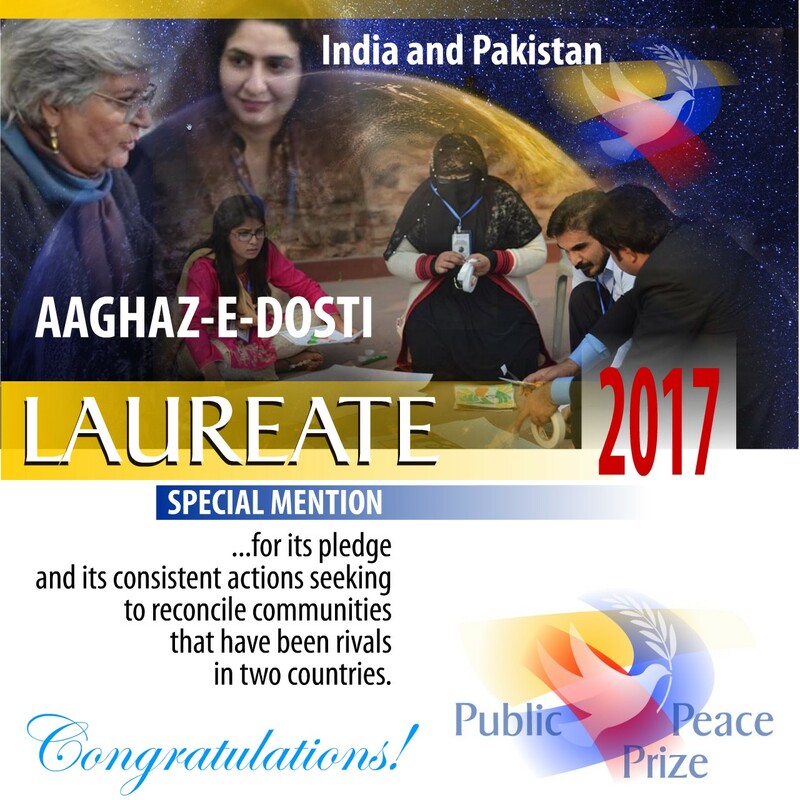 This prompts the jury to proclaim AAGHAZ-e-DOSTI Laureate for the 2017 Public Peace Prize in the category Mediators for Reconciliation between Groups Divided by Conflicts. 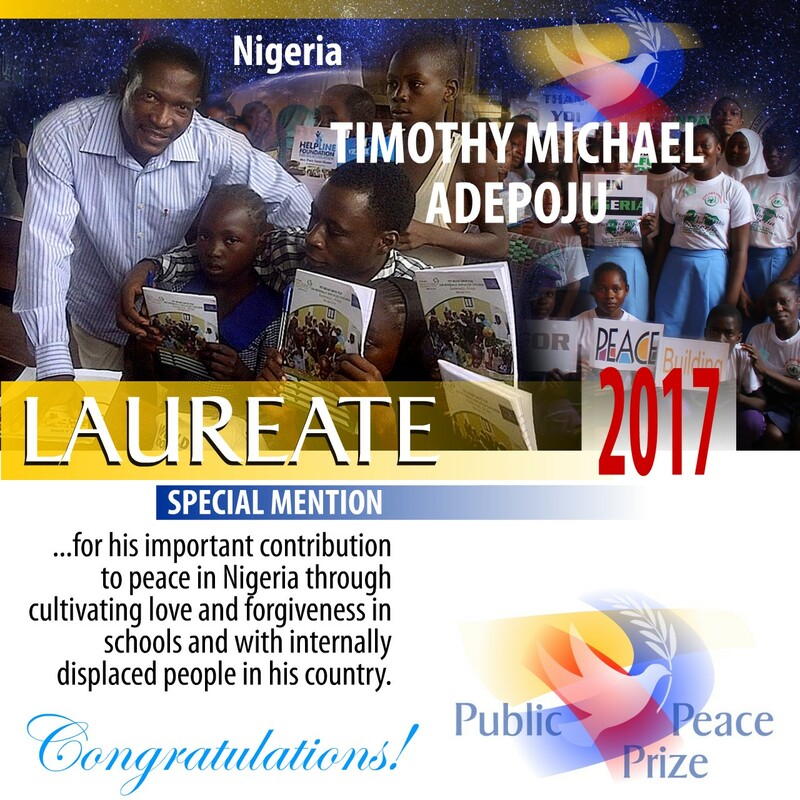 Timothy Michael Adepoju is a dedicated peace activist whose day-to-day life demonstrates his belief that “peace is possible In Nigeria”. His passion to engage in service to humanity was sparked in February of 2006 when he witnessed the killing of his mother, brother and sister during a religious crisis in the northern part of the country. The Triade Peace Foundation has since been formed (TRIADE means trio of Adepojus’ murdered) as an organization to promote love, forgiveness and tolerance, irrespective of religion, beliefs, tribe, culture and ethnicity. A graduate of electrical engineering, Timothy Adepoju has studied conflict resolution and peace promotion and is currently providing psychosocial support to the Internally Displaced Persons (IDPs) in refugee camps, and promoting peace through schools using students as gatekeepers to the wider society. He also uses audio and video documentaries to walk victims through his own experience to teach the love and forgiveness he has learned to demonstrate during and after the crisis. In recognition of the quality and the quantity of the support received, mainly from his own country, which particularly underlined his resilience, the jury applauds the important contribution to peace in Ghana by TIMOTHY MICHAEL ADEPOJU, Laureate of the 2017 Public Peace Prize in the category Peacemaker Committed to Non-Violence and Reconciliation. Patrick Tocko Maloum is an expert in international conflict resolution and in the fight against violent extremism. He is currently National Coordinator of a UN network of youth leaders in Cameroon. He has worked in the Central African Republic, in Côte-d’Ivoire, and in the Democratic Republic of Congo with civil society organisations and with UN missions to support conflict resolution, gender integration mediation, disarmament, demobilization and the reintegration of child soldiers. He returned to help contain the migratory flow of refugees and to prevent regionalization of the conflict. Patrick Maloum led campaigns for the abolition of torture in Cameroon His actual work includes projects fighting against militarization of children, forced marriages of young girls and sexual violence against girls during and after war. Supporters from Cameroon and other countries underscored the quality and effectiveness of the intervention of this professional mediator for peace and recognize his international influence. 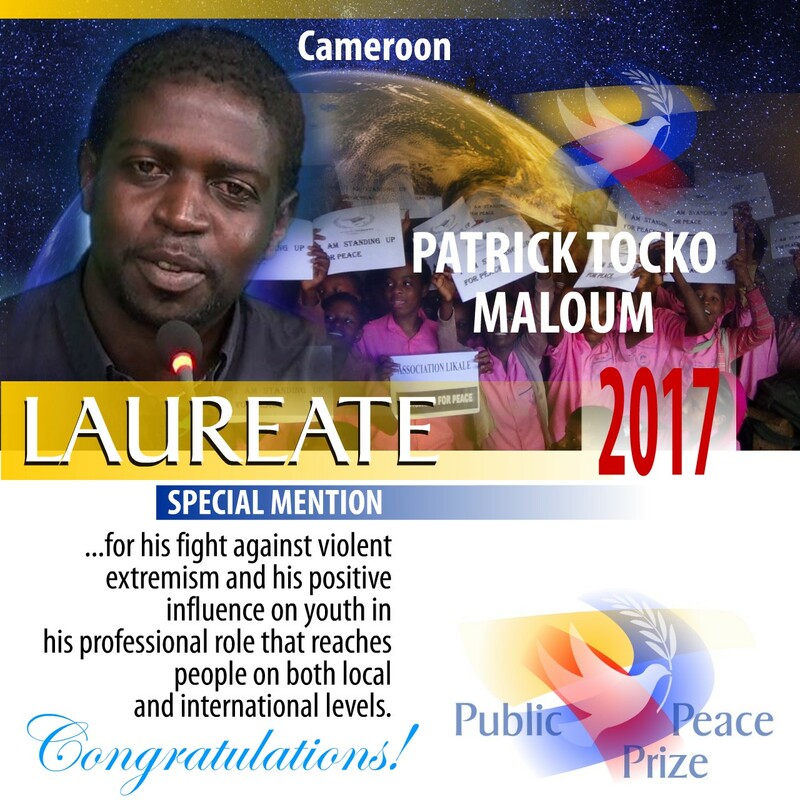 The jury, therefore, proclaims PATRICK TOCKO MALOUM, Laureate of the 2017 Public Peace Prize in the category Peacemaker Committed to Non-Violence and Reconciliation. Repair in tenderness what has been damaged by violence. These words sum up the challenge taken up by Creciendo en amor (Growing in Love), an educational program for children and parents of Cartagena, a city that has been marked by the consequences of Columbia’s civil war. Creciendo en Amor works with the intention of giving tools to parents and guiding them about the evolution and the development of their children – including physical, emotional, social, intellectual and creative aspects – tools that will improve communication mutual understanding. “Creciendo en Amor” is program run by the non-profit organization Fundacion Pies Descalzos (Barefoot Foundation) founded in 1997 by the well-known Colombian singer Shakira. Its mission is to help children in vulnerable situations based on a model that places school at the centre of community development. This program can be reproduced in any part of the country, and truly promotes peace through education and being good neighbors. 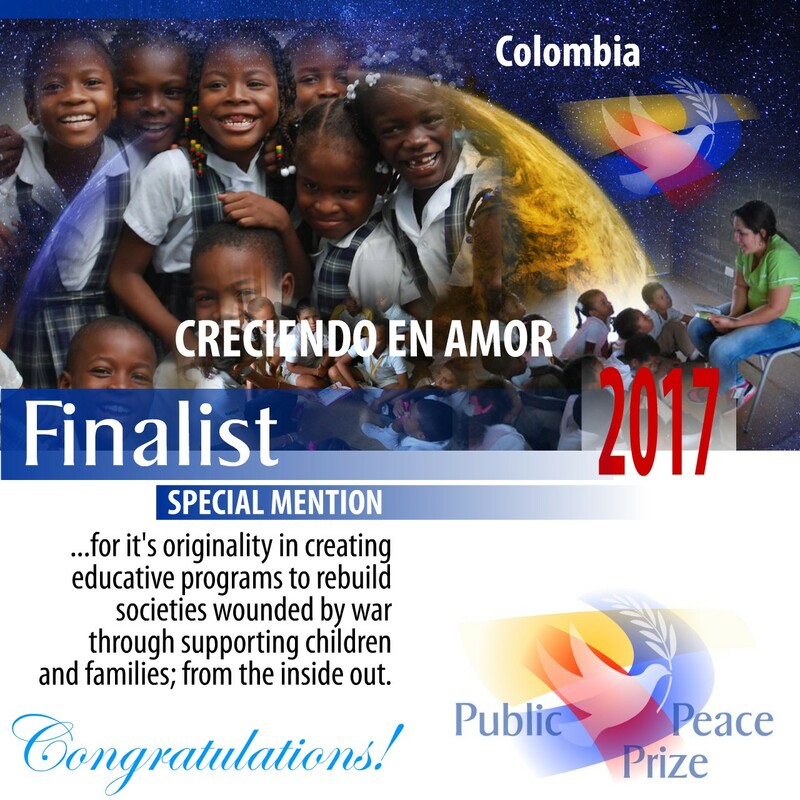 The jury offers its most sincere encouragements to CRECIENDO EN AMOR, 2017 Public Peace Prize finalist in the category Peace and Nonviolence Initiatives through Education. 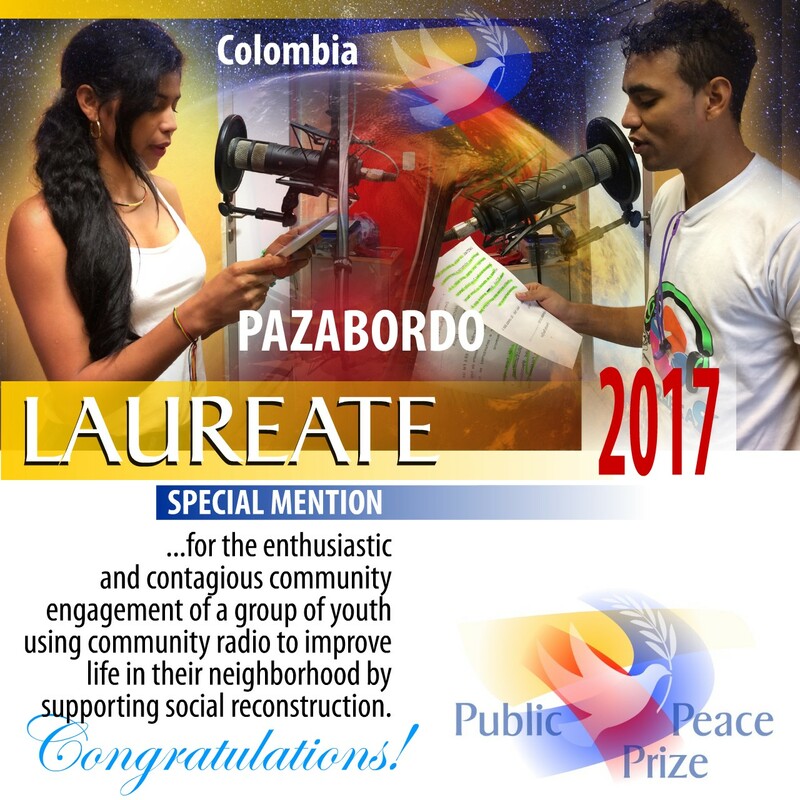 In the south of Barranquilla, the fourth biggest city in Colombia, a youth group started a citizen’s initiative made up of 15 youth named Pazabordo, in order to participate in rebuilding peace in their communities through radio. Having received financial help from the minister of culture, Pazabordo was able to use this financial contribution to deliver a series of ten programs on community radio in the southern area of Barranquilla between September and December 2016. These programs allowed the youth to tell their stories, and to recover the collective memory through local initiatives for peace and sharing their peace projects. Thanks to this citizen’s initiative, the students had the opportunity to prepare their own content and deliver radio shows. Radio once contributed to propagating violence and murder in these communities, but thanks to Pazabordo, the students discovered they could use these same radio waves to deliver a message to support social reconstruction. They reflected on their right to communicate and their own role in the rebuilding of a society. The large amount of enthusiastic support from young people and organizations strongly contributed to the recognition of PAZABORDO Laureate of the 2017 Public Peace Prize in the category Peace and Non-violence Initiatives through Education and Medias. “Peacemakers defending linguistic minorities” and “Public initiatives for reconciliation, social transformation and peace” categories! International Men’s Day promotes a way of life; a way of looking at the world, which is different from the current social model. The objective of this initiative is for future generations to live better, to live in tolerance, mutual acceptance and harmony between the sexes. Celebrated annually in 80 countries on November 19th, this day was established in 1999 in Trinidad and Tobago. Its goal was to better understand the challenges faced by men and boys in a global context of non-violence and peace. The themes explored through various activities are mental health, fatherhood and gender equality. The initiative has the support of a number of peace organizations, women’s movements, politicians and people seeking social transformation. The jury offers its sincere encouragements. 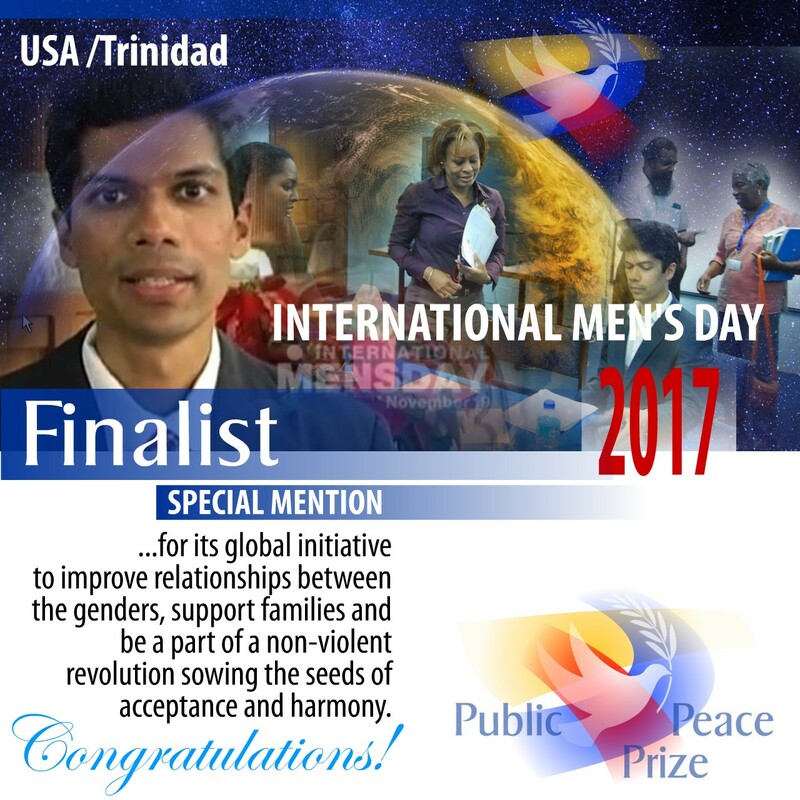 The support received from different countries countries bring the 2017 Public Peace Prize to make the INTERNATIONAL MEN’S DAY finalist in the category Initiative for Reconciliation, Social Transformation and Peace. Outraged by the abuse against populations in the Swat Valley, in Northern Pakistan, Zubair Torwali uses his gifts as a writer and journalist to defend human rights and the right to education for all in a pluralist society. The Torwalis, Gwaris, Gujars and other linguistic groups which only now have been recognized have found their dignity thanks to his advocacy work, research and publications. In 2007 Zubair Torwali founded the Institute for Education and Development (IBT – Idara Baraye Taleem—o-Taraqi) of which he is currently the director. The schools that his organization has established in the community to increase literacy have also helped to put female teachers on the forefront of quality education, and have become a beacon of hope for the future of education in one of the most troubled areas in the world. The encouragement received from citizens and colleagues in his country reflect Zubair Torwali’s exceptional courage. In 2012, he received the Human Rights Watch’s Hellman /Hammett Grant which is awarded to writers who are threatened because of their work for the right and freedom of expression. 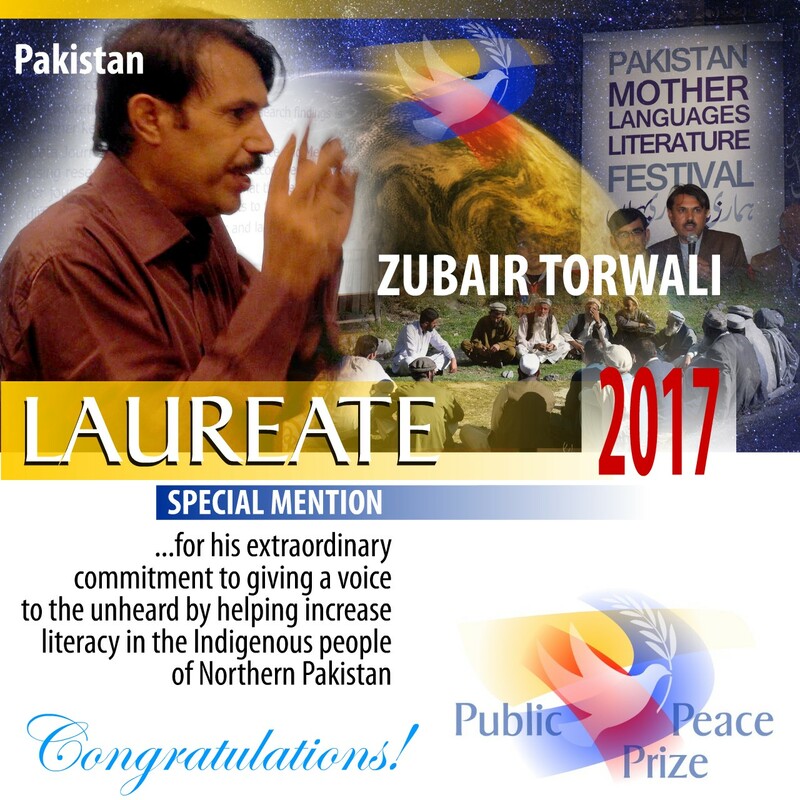 The jury joins its congratulations to the support received from the public and makes ZUBAIR TORWALI Laureate of the 2017 Public Peace Prize in the category Peacemaker defending linguistic minorities. 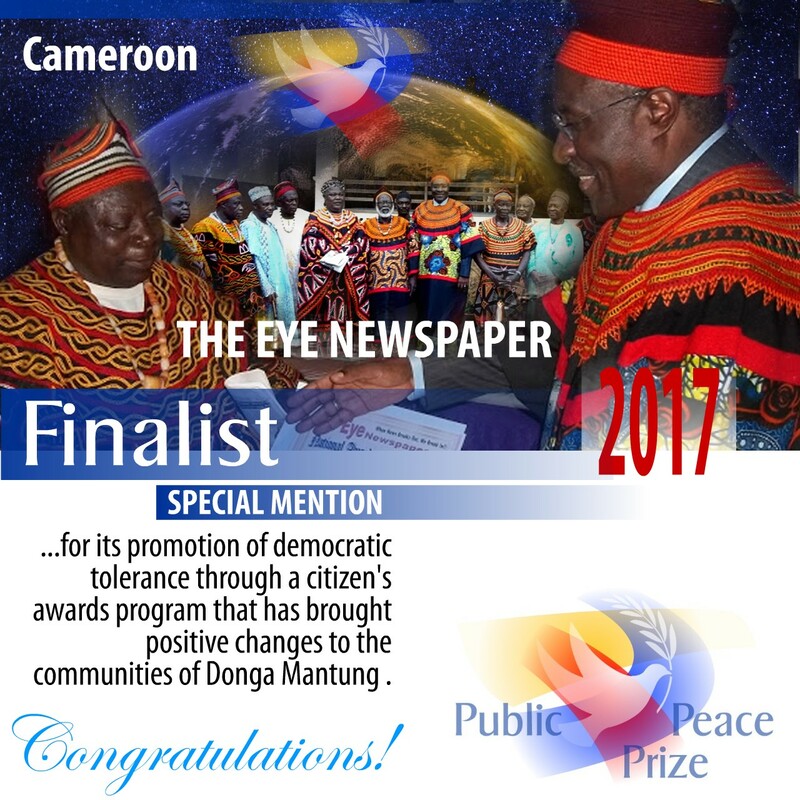 Our gratitude to ALL the finalists and Laureates, we invite you to send your messages of congratulations on the profile pages of the peacemakers and peace initiatives, both for the finalist and the Laureates. Congratulations to all! What an amazing and inspiring group of wonderful people! You give hope to a depressed and despondent world.